Chris is a Certified Financial Planner™ professional who has successfully guided and managed sustainable financial plans for corporations and individual clients since 1995. Over the course of his career, he has served as a committed advocate of strong ethical principles in the financial industry. Because many clients are business owners, Chris and team specialize in working with employer 401(k) qualified plans and multi-generation families. Locally, Chris serves as chair-elect of The Children’s Museum of the Upstate, the only Smithsonian-affiliated children’s museum in the country. Chris is a member of the South Carolina chapter of the Financial Planning Association and of the Greenville Estate Planning Council. Chris is originally from Charlottesville, Virginia. He is a graduate of Clemson University and a rabid Clemson Tigers fan. His wife, Heath, is a Carolina Gamecock, so they are already debating where their daughter will go to college. 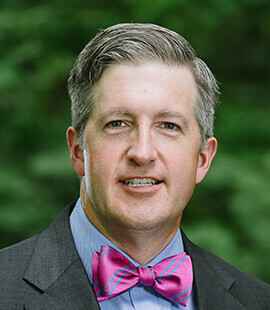 He enjoys playing golf and snow skiing, and is active in mentoring students of Clemson University’s College of Business and Behavioral Science. Securities offered through Raymond James Financial Services, Inc., member FINRA / SIPC. Investment advisory services offered through Raymond James Financial Services Advisors, Inc. Gateway Wealth Strategies and the bank are not registered broker/dealers and are independent of Raymond James Financial Services. Investment products are: not deposits, not FDIC/NCUA insured, not insured by any government agency, not bank guaranteed, subject to risk and may lose value.